I happened to be out for a sail on Monday night and it was cold, foggy and very little wind. I only hoped that these conditions were not an omen for our Tuesday sail. Showing up to the harbor, the wind was clearly from the East and there was not a cloud in the sky. In short, a beautiful night for a sail! We got out of the harbor and made our way to the start mark. We called course B4: Start, Blacks Gov, Finish. We blew our 5 minute horn and set up for our start. It was miraculous that there were no boats at the pin end and we had a clean start right at the pin end. The mad rush was on to Blacks with Pacific Spirit to our port and ahead and Guenther on his fin just off our starboard rail. We were slowly gaining on Pacific Spirit and when we got just ahead of them, we tightened our main to give them disturbed air and they quickly fell back and tacked over for clear air. We rounded blacks and everyone was on the long slog to Gov, with everyone using their whisker poles to their best advantage. We started with pole on port, but when Homer was gaining on us with pole on starboard, we switched. Eiquinimity (Homer) was the first to round Gov with Guenther and us following. 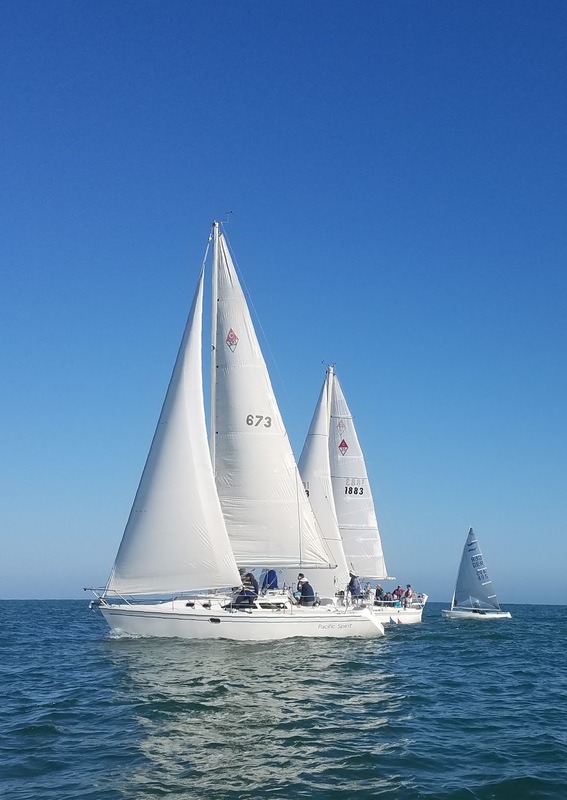 Right after rounding the mark Pair a Dice got a little crowded with other boats and ended up with a backwinded jib and drifted into a mild kiss with Gov. We proceeded to round the mark again completing our penalty 360 turn and continued back toward the start mark. All boats were taking different courses to the start mark. We headed inside after clearing the downwind boats and sailed clear to the lighthouse jetty. 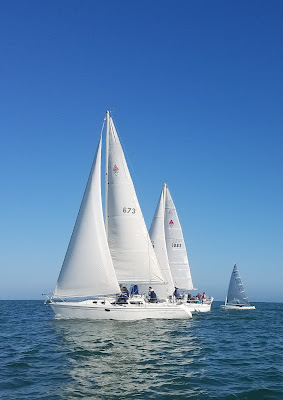 At the finish, it was Homer, Pair A Dice, Guenther on his Fin, Pacific Spirit, Perfect 36, Kicks, Nidaris, Odonata, a Catalina 27 (name? ), Sea Quake, Aeolian and Scotty C sailing his Catalina 40 by himself. It was not until Homer started passing us that I noticed that our pole was on the wrong side. Set properly the whisker pole and the boom should approximate a straight line. With the pole on the port side and the angle we were sailing, they were not nearly in line. Once we changed the pole to starboard, we gained speed with both in line. Everyone knows starboard tack boat has right of way over a port tack boat and leeward boat has right of way over a windward boat. Yes and overtaking boats yield to boats ahead. Over riding all of these well know rules is rule 14. Rule 14 says to always avoid collision. I know the heat of the race can cast caution to the wind but we all need to remember: race hard, keep an eye open for your competitors, follow the rules and avoid Collisions! Sailing is a team sport and it is every crew member’s duty to apprise the skipper what other boats are doing. Over dinner, Homer brought up a concept that nobody has broached before with me. Why start at 6PM when the evenings are so long now? It is true that many people work till late and we all must fight traffic getting to the harbor. Lets make it a little easier for people and, instead of a 6PM start, lets start at 6:15 until it starts getting shorter nights. NEXT TUESDAY IS BARBECUE NIGHT AT THE CLUB. BRING YOUR FAVORITE GRILLING FOOD. THE BAR WILL BE OPEN!